Centre for Human Virology and Genomics (CHVG) management, staff and World Health Organisation (WHO) after one of their meetings, recently. Loss of capital flight from misdiagnosis of human immunodeficiency virus (HIV-1), hepatitis B and hepatitis C in the country will now be a thing of the past with the listing of Nigerian Institute of Medical Research (NIMR) as a WHO Prequalification Evaluating Laboratory. With the World Health Organisation’s (WHO), accreditation, NIMR would now conduct Independent performance evaluations of In Vitro Diagnostics (IVDs) which will assist in the diagnosis and/or monitoring of infections with HIV-1, hepatitis B and hepatitis C, the institute announced weekend. 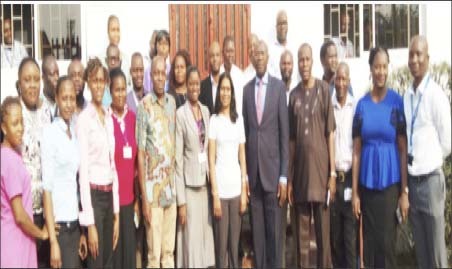 Speaking for NIMR, Prof Babatunde Lawal Salako, Director General/CEO of the institute told journalists that the Independent performance evaluations of IVDs which will be done by the NIMR’s Centre for Human Virology and Genomics (CHVG) will either be coordinated by WHO or commissioned by a manufacturer. Prof. Salako explained that NIMR scaled through the re-audit of the laboratory to ISO 15189:2012 standard by WHO Geneva on Monday January 22, 2018 which has made CHVG the first laboratory in West Africa to attain this feat. He also said that the development is a very timely one that will reduce medical tourism and misdiagnosis of infections with HIV-1, hepatitis B and hepatitis C.
The NIMR boss said; “The Center for Human Virology and Genomics (CHVG) in the Microbiology Department at the Nigerian Institute of Medical Research (NIMR) has just been listed as a WHO Prequalification Evaluating Laboratory. “This happened after a successful re-audit of the laboratory to ISO 15189:2012 standard by WHO Geneva on Monday 22nd January 2018. This makes CHVG the first laboratory in West Africa to attain this feat. “It therefore means that this laboratory is now listed as a WHO Prequalification Evaluating Laboratory to perform evaluation of In Vitro Diagnostics (IVDs) either coordinated by WHO or commissioned by manufacturer. The DG also said that the journey to being listed as a WHO prequalification evaluating laboratory began in December 2016, at the satellite session of Strengthening Laboratory Management toward Accreditation (SLMTA) workshop. He also said that participants were challenged to attend the WHO session on prequalification evaluation of In vitro Diagnostics at the conference organised by the African Society of Laboratory Medicine (ASLM). To be eligible to apply, laboratories have to be national laboratory that provide testing services to the government in their respective country particularly those located in geographical areas corresponding to the intended setting of use of the IVDs, such as Africa, Prof Salako said. He further said; “As soon as the ASLM conference was over, we completed the WHO online forms and by December 23, 2017, we submitted an application to WHO Prequalification of In Vitro Diagnostics Programme (3), Geneva. The initial audit by WHO was scheduled for a date in May 2017 by which time the pre accreditation assessment by the accrediting body had taken place. He also said that his institute completed the WHO online forms as soon as the ASLM conference was over and submitted an application to WHO Prequalification of In Vitro Diagnostics Programme (3), Geneva by December 23, 2017. “We therefore enjoin other medical laboratories recently accredited in Africa to take up the challenge to identify long existing gaps that had limited best practices in our health systems. For Dr. Rosemary Audu, Deputy Director Research, NIMR, her joy was palpable, being the Laboratory Director, CHVG. Obviously excited at the development, she told Daily Independent; “This laboratory in the Centre for Human Virology and Genomics now has the capacity to conduct prequalification evaluation of IVDs which will assist in the diagnosis and/or monitoring of infection with HIV-1, hepatitis B and hepatitis C.
“With the recognition of the global health body, when it evaluates a test kit for hepatitis B, hepatitis C or HIV, the result will be accepted anywhere in the world, it means that Nigeria or any other African country can use it. “We started doing it for National Agency for Food and Drug Administration and Control (NAFDAC), that’s where we got our competence from. When test kits come into the country before they get NAFDAC number, they will send them to us for evaluation. “Globally, any kit that does not have a sensitivity of 99 per cent is not good enough. So we evaluate kits to avoid misdiagnosis, then we calculate the sensitivity to ensure it meets WHO requirement. If it meets the WHO requirement, then it will be handed over to NAFDAC for registration. “This accreditation by WHO is beyond Nigeria, it means that if we evaluate any test kit, it has global recognition. This implies that the test kit would be included in the WHO list and this will reduce medical tourism,” she added.